I really love the traditional Night of Navy and Whisper White with a touch of silver. Makes such a pretty and bold card. Each year I have to make one like this and one with Real red in place of the Night of Navy. Those are my two favorite color combos from Christmas. 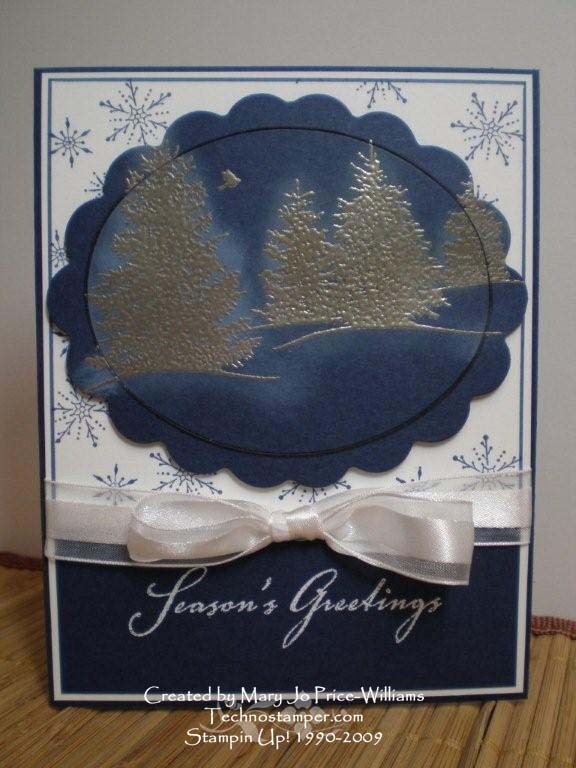 I am loving the added glow that I have around the trees on this card, it was so easy to do too. I stamped the image with versamark on the Night of Navy card stock, then embossed with silver embossing powder that had a small amount of gold mixed in. Very pretty color. Then I used a sponge and white craft ink to add the glow--after you can just wipe off any that is still on the embossed image and you are done. So easy yet so pretty! 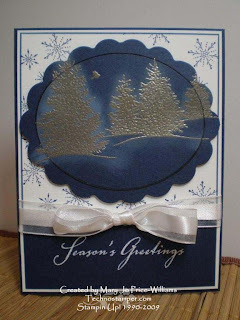 This card fits the Latenightstamper's challenge to create cards for your favorite holiday and the SUDSOL challenge to use the Scenic Season Set. All supplies current Stampin Up! This is absolutely awesome! Thank you for sharing and giving me something to aspire to! Very pretty~ I love that glow!